I get asked this a lot so thought I would put down some of reasons I like stick shaped paddles more than the Euro spoon shaped paddles. Kayaks were developed over thousands of years along with paddles that are stick shaped. If they didn't work well the design wouldn't have survived so are worth giving a try. The main issue is that they work so differently than euro spoon blades that when people first try one and use them like spoon paddles they don't perform well so they give up. Once you learn how to use one them the way they are meant to be used they are a beautiful, elegant and efficient tools. Spoon paddles use drag, you reach forward, dig in and pull yourself forward. The greatest resistance is at the start of the stroke when you are reaching and extended the most putting a lot of strain on you. Greenland style paddles generate lift like a plane wing. The paddle slices into the water easily at the start and ramps up resistance as it moves through the water putting a lot less stress on your body. Spoon paddles lose all power by the time they are beside your hips while Greenland paddles generate power all the way to the stern of the kayak. You use more large muscle torso rotation and less arm muscle to push the paddle to the stern so you can paddle more efficiently without sore arms. This also makes for a longer power stroke so you use fewer stokes to cover the same distance. Greenland paddles are never feathered so you can hold your wrists straight in their strongest position reducing fatigue of you smallest weakest joint. They also have a rectangular loom the fits your hand shape easily so a strong grip isn't needed eliminating hand fatigue that some get from gripping a round shaft. Greenland paddles made of Cedar are light but also the heaviest part of the paddle is between your hands not out on the end of the shafts. You also keep the paddle and your hands/arms much lower when paddling and not lifting your hands, arms, paddle as much reduces fatigue. The thin blades make it easy to extend the paddle out and hold from the end for more power when doing sweep turns, bracing, sculling, rolling, etc. The Greenland style paddles are symmetrical so no worrying about having the correct blade face direction. They don't work as well as spoon shaped paddles for things like sprinting or whitewater paddling where digging in for quick maneuvers are important but for touring they can't be beat. Plus it's pretty easy to make your own in an afternoon that's easily as good as one you can buy. I ran a frame build class over the Christmas holidays. We are building just the frames for now and will follow up with the skin and goop once the weather becomes more reasonable around April. Sometime between now and then we will steam bend the coamings and get them ready for the skinning day. Below are photos of the end of day one progress. One of the great things about this type of building is it doesn't take long to see what you are making and that keeps you inspired. Even though some of these parts aren't lashed on yet things are moving along nicely. Day two mostly involved working on the deck, bow and sterns. 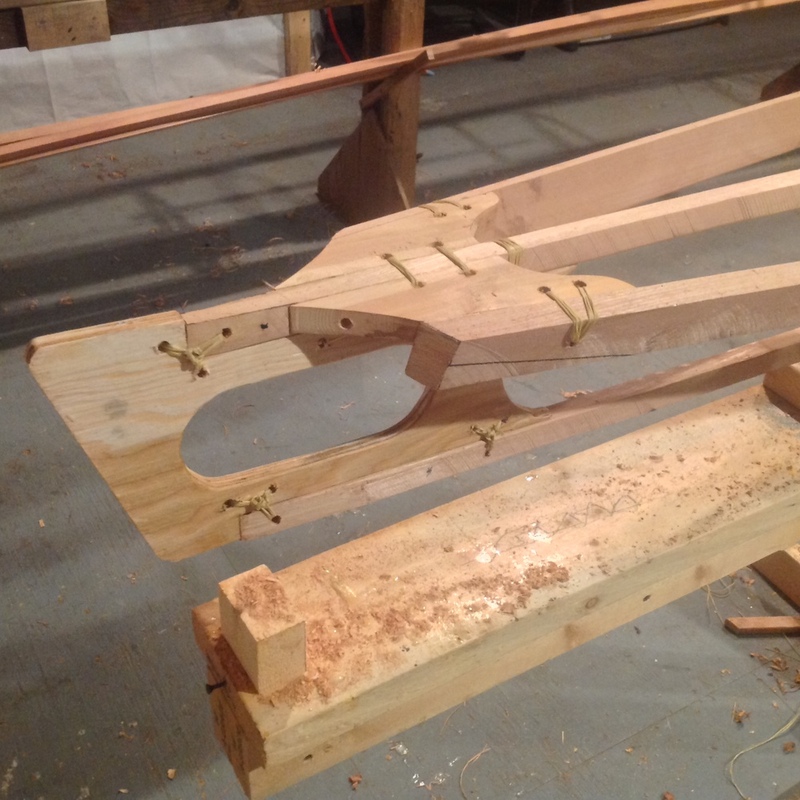 The shapes are adjusted partly for personal preference but mostly to flow with the shape of the kayak; it all needs to work together, forcing it is a sure way to make an ugly boat. 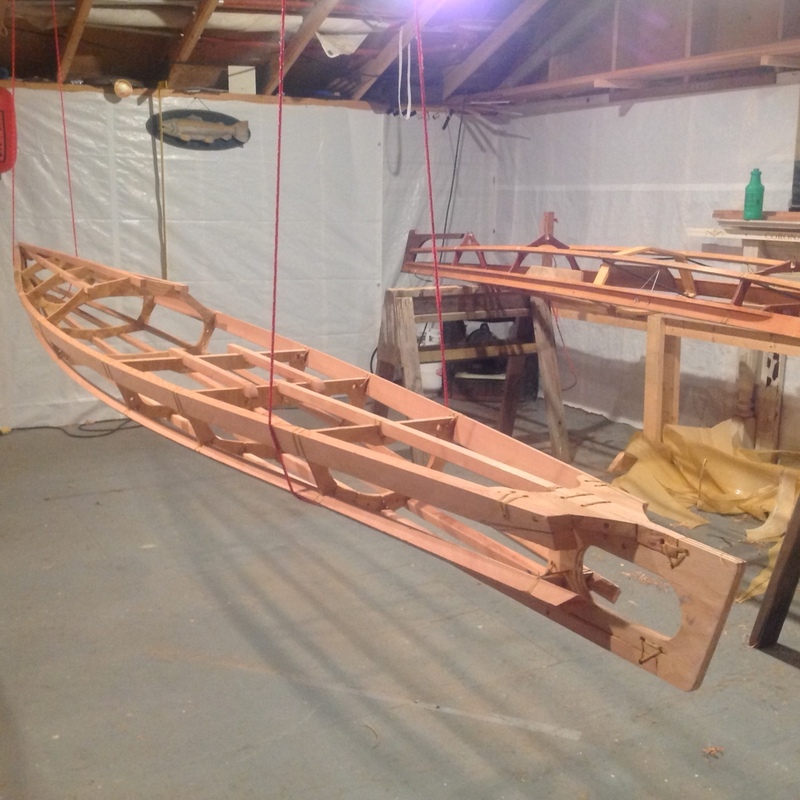 As you can see the 15' kayak has a Baidarka style stern with a rounded front deck and the 17' one has a peaked front deck and non Baidarka stern. Both have flat Greenland style rear decks. 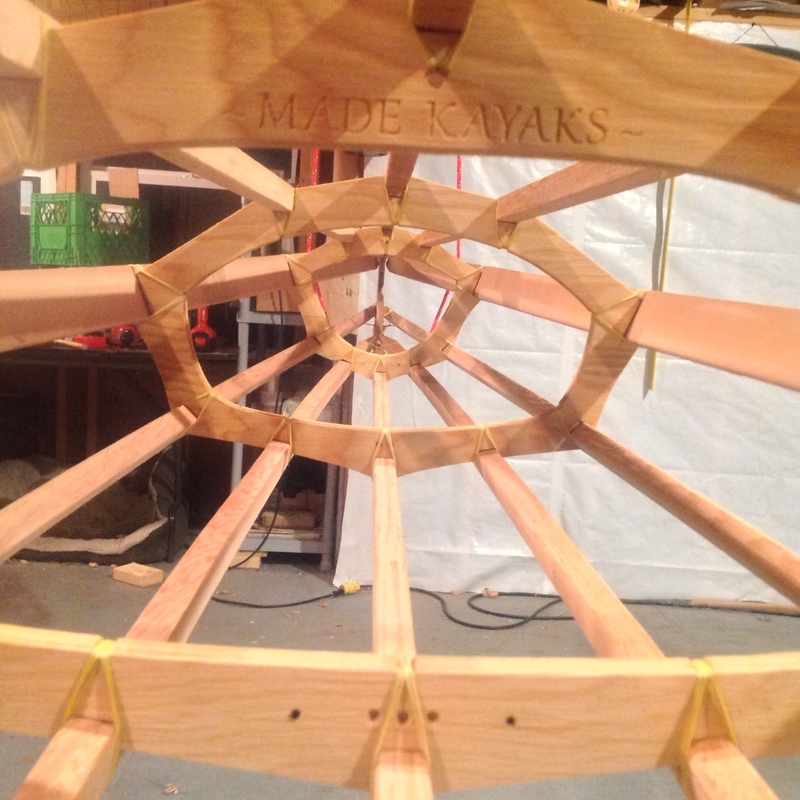 Day three for the 15' kayaks has the chines being lashed on and small detailing work to finish up the frame. There were two people working on this one so it was finished up quickly. A realistic time line for a one person build is about 4 days to finish a frame. 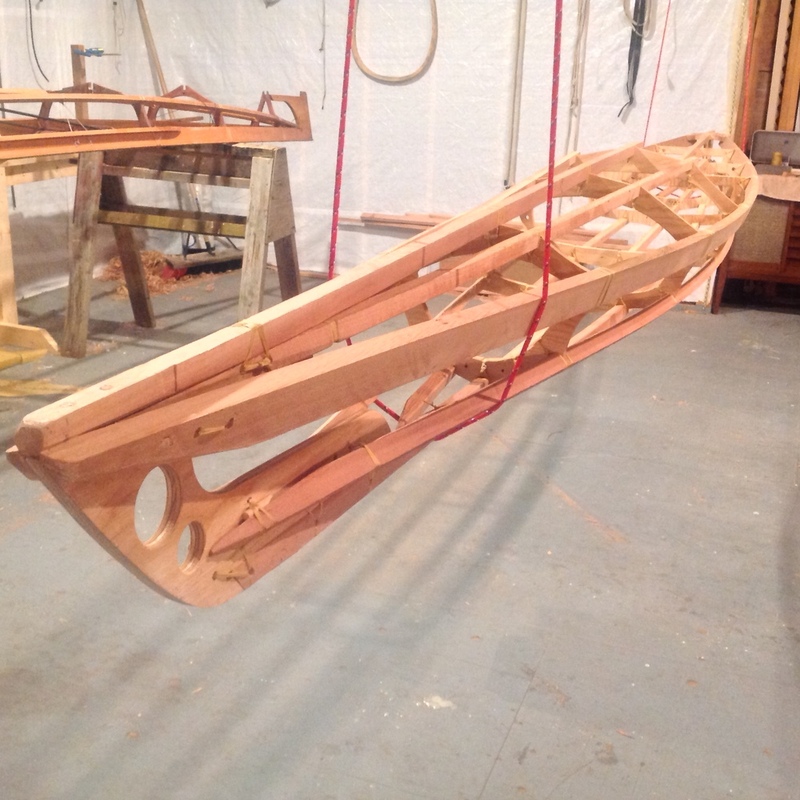 The other kayak will be finished up soon with one more day of work. "The puzzle is not why did human beings start lashing things together, but why did they stop? We still sew our clothing, sails and tents and our surgeons still sew us. But we no longer sew or lash much else. "When two pieces of high tempered thin-wall aluminium tubing are attached with eight turns of 60 pound test twine, you can be sure that it will something close to 8 x 4 x 60, or 1800 lbs to pull them apart. There is no risk of metal fatigue, and the joint will flex elastically (and repeatedly) long before it breaks. Shock absorption is built in every boat." "Not only are lashed fastenings unusually robust and structurally sound, they are pleasant to work with, are forgiving of sloppy craftsmanship, and celebrate the abilities of human hands.. If you complete a a seam or lashing and decide it could be done better, you just undo it and try again. You can stop work at a moments notice, and resume any time. You can strive for perfection but a haphazard looking lashing will be almost as strong." I have built using the more common methods, screws and epoxy and I have found that I greatly prefer lashing. I see several advantages. Its cheap! A roll of sinew is $5 and that is enough to build at least 3 boats. I can lash one in roughly the same amount of time it takes me to screw one together, then take it apart, epoxy the joints and screw it back together. Then clean up the excess epoxy that is squeezed out. Plus if the phone rings in the middle of lashing or someone walks in I just tie it off with a couple of wraps and answer. With epoxy I am committed to work faster. It's easy to repair if something does break. I have yet to have a lashed joint break and I have had epoxy joints fail. I am sure I did something wrong but I had no warning, they looked fine and just turned loose. With lashing once it is finished I know if I made a mistake. Plus it is simple for a beginner to learn. I expect to be working with a lot of first time builders. The drawbacks are...... I haven't found any. Well sore hands and fingers after a day or lashing."